Breath-control has been described as being 'zen itself in its physiological aspect'. Even before schools of Zen existed the relation of breath-control to awareness was a major preoccupation of Indian 'yoga' and chinese 'taoism'. One's rhythm of breathing is, after all, affected by either the physical or mental state that one is in. When exhausted after training, one breathes heavily; when excited, one breathes quickly; when one laughs, the emphasis is on the outbreath; when one cries, or is afraid, the emphasis is on the inbreath. But also it can work the other way: one can affect the mental and physical condition by controlling one's rhythm of breathing. The use of 'kiai' (or a shout) in Karate is one aspect of a wide application of breath-control. In order to shout one must breathe out. The obvious point is that sharp exhalation tends to contract the muscles, and particularly the abdominal muscles the use of which is essential for any really solid technique. 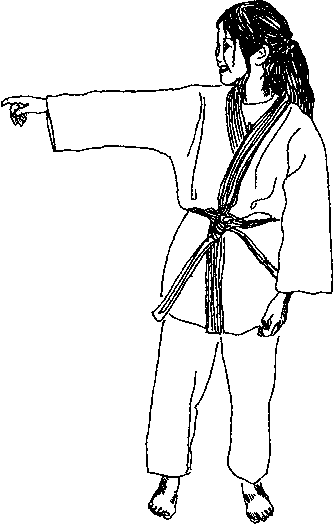 Another point is that by emphasizing the out-breath (by the same token as that by which one emphasizes the out-breath while laughing) one tends to increase one's confidence, and if this is communicated with the 'kiai' to your opponent his confidence will tend to be correspondingly undermined. A further point is that one's vision is clearer (look at a page of print and breathe out sharply) and reactions quicker during exhalation. It follows from all these points, not only that one should breathe out at the moment of attack, but also that the moment of attack should come when your opponent has just emptied his lungs and can therefore only breathe in. Don't imagine that a loud shout is necessarily a strong 'kiai'. It must be full of aggression and come from the stomach. Breathing into the stomach rather than (or as well as) into the chest is in fact a rule common to all the oriental disciplines, spiritual or otherwise, that are concerned with breath-control. Breathing in this way does increase lung capacity, but in addition contributes a sense of well-being perhaps physically connected with the resultant lowering of the centre of gravity. One feels more stable - this point is certainly important to karate. Breathing into your stomach must become a habit and then your 'kiai' will be spontaneous and effective even when not necessarily loud. To begin with, however, you must simply remember to shout loudly from the bottom of your belly when you perform a technique. In due course, you will perhaps master 'kiai' in its real sense, and will then often be able to overcome an opponent without fighting at all! To be able to convey so much confidence and will-power as to do this - simply by breathing! - is to exercise the advanced martial art of 'kiai-jutsu'. 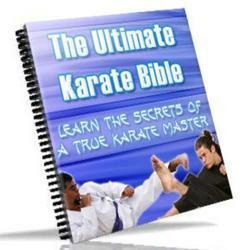 This might be said to be the perfect finished form to which all the martial arts aspire.